Danny vs. the internet: Royal wedding invite? I am the second luckiest girl in the world! ! ! 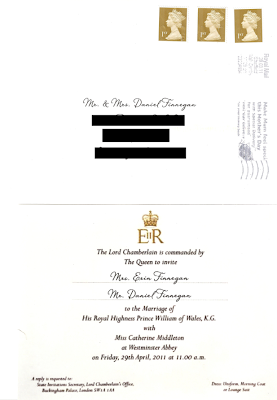 I have been invited to the ROYAL WEDDING! ! ! My invite came in the mail yesterday and I have been floating on a cloud ever since. What should I wear? I need a hat! Do you think there are any available rooms at the Goring Hotel?! I am going to bond with Pippa while I eat all the food she passes over, talk Top Gear with Harry (You KNOW he watches it), and ride in a carriage with the little bridesmaids. I am so in with the Royal family. I'm going to get invited to the Jubilee celebrations for the Queen, be the God Mother to The Duke's and Duchess' first born, and be Princess Kate's confidante. Wait. What is that you say? I'm a week late? But who would pull such a prank on me to make me believe I would be invited to the royal wedding? My Husband? My Sister? My British Friend? ALL THREE??? You mean a transatlantic prank? No way, too complicated. I don't believe it. And I already bought a hat. I guess I'll have to live vicariously through Google like the rest of the world. A special thanks to D, K, and A. I don't think I laughed so hard in a long time. I really appreciate how much time and thought went into making me feel British for a day.